Listening to old Ninny Threadgood's lively stories of Idgie and Ruth's adventures as she relates them to Evelyn never fails to make me want to go barefoot, charm bees, and eat some good Southern food. Some days, I just need to yell.... TOWANDA! I rarely measure ingredients out when using the standard breading procedure (flour, egg wash, bread crumbs)...so, please click on the link to Bo's Bowl for more precise instructions, if you like. Basically, slice up as many green tomatoes as you need. Season up some flour with salt and pepper...add other seasonings, if you wish (this is gonna add flavor to the finished dish...I always season my flour). Put all of that in one wide, shallow dish. Beat up some eggs and put those in another dish. Add bread crumbs to a third dish. Heat up about an inch of oil until it is shimmering. Bread your tomatoes by dredging them in the seasoned flour and shaking off any excess, then dipping in egg, then into the bread crumbs to coat. Carefully slide them into the hot oil until golden on both sides (flip, if needed). Transfer to a paper towel-lined plate while you cook up the rest. Serve as is or with a dipping sauce. I used a Spicy Ranch like Bo suggested...although I didn't realize I was out of Sriracha until I was already making them. So I just spiced it up with some Tabasco. So tender on the inside and crispy on the outside. I loves me some Fried Green Tomatoes! Combine all of the pork ingredients in a slow-cooker. Cook on high for ~5 hours or low for ~10 hours. Drain off most of liquid and pull the meat apart with two forks. While pork is cooking, make sauce. Combine all of the sauce ingredients in a small saucepan and bring to a simmer, stirring until sugar is dissolved. Let cool and refrigerate until ready to use. Add sauce to pulled meat in slow cooker and continue to cook for another hour or two. 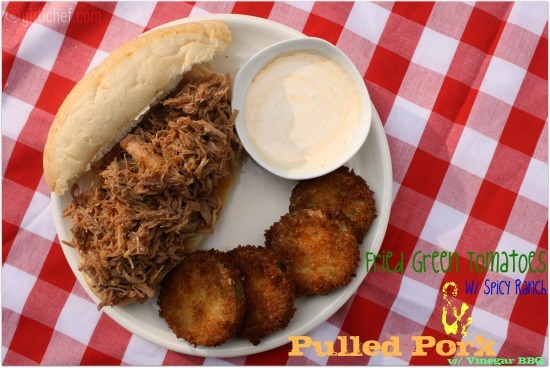 Pile on buns, rolls, or bread (drizzle with more of the sauce in the pot) and serve with Fried Green Tomatoes! This dish clears your sinuses and packs a punch! Plus, it freezes well. I'm sitting here laughing because I just rewatched FGT the other night and had the same idea to make pulled pork with fried green tomatoes. After looking at this I know that's what I'm making. It's all making my mouth water! The pulled pork and the tomatoes look perfectly done. This whole meal looks awesome...and thanks for the shout out...I haven't seen the movie in years, but the Irondale Cafe(the cafe Fannie Flagg based the book on)is close by and is the best place to get fried green tomatoes in town. I will use your recipe to rectify that. Why didn't you invite me over. One of my favorite meals. YUMMMMMMM. I love the book, I love the movie. Now I just need to get me the cookbook. Fried Green Tomatoes is one of my favorite movies. Mmm... I LOVE Carolina pulled pork. Vinegar-based BBQ is oh so delicious! Great interpretation of a great book and movie. And, your pictures made my mouth water. oh, the plate makes my knees weak..yum. Love the use of panko! Great movie inspired food! Esta receta siempre me recuerda a la famosa película, que ricos te han quedado. I do love that movie. And especially Kathy Bates. I've tried the dish and just don't care for it so much. But still, I loved the post! I am now officially starving! 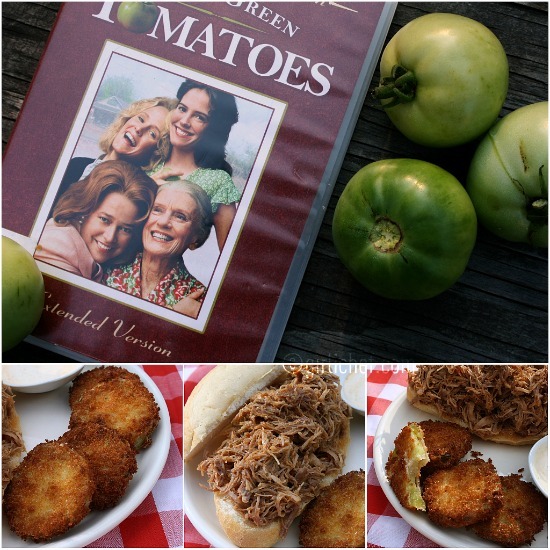 I love this movie and your pulled pork and fried green tomatoes look awesome. Love that vinegar barbecue sauce! Towanda! This is one of my favourite movies Heather. I have it on the PVR and watch it often! 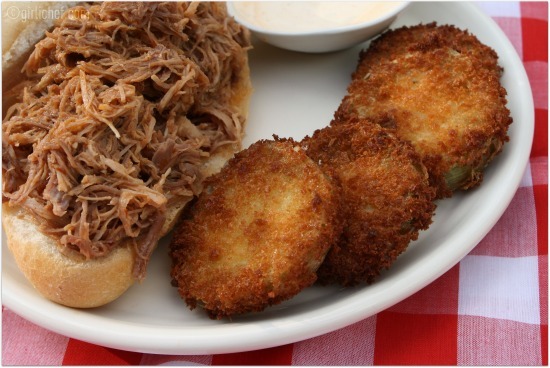 Can't get more classic Southern than fried green tomatoes and pulled pork! you definitely went all out for this food n flix! Your sandwich looks delicious! I've never tried pulled pork sandwiches before (I've tried a pull lamb sandwich...?) but now I want to make one. My fave lunch place has a rockin' fried green tomato sandwich, which I always order and seeing your tomatoes makes me want to make them at home. The pork looks awesome too. One of my ALL TIME favourite films, I watch it several times a year and now I have a fried green tomato to recipe to try! God, I haven't thought about that movie in ages! It WAS a great film and you've done it justice with this classic 'Cracker' feast! Yummm! Those fried green tomatoes are making me drool! I love that movie....LOVED it. Need to rent it and watch it again. This whole plate of good looks wonderful Heather. Great photos. That looks like a great meal. Love the movie and it's been too long since I've seen it! These look fabulous! 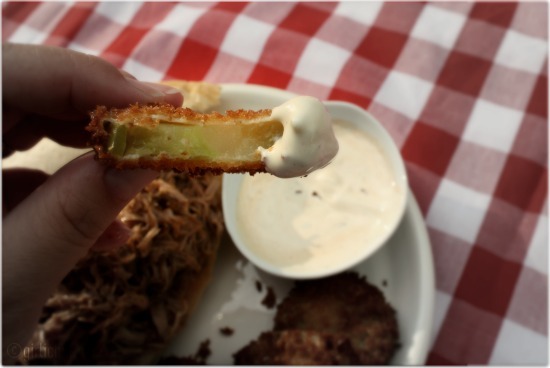 I love pulled pork, but I've never had fried green tomatoes before, definitely something to try! Thanks! 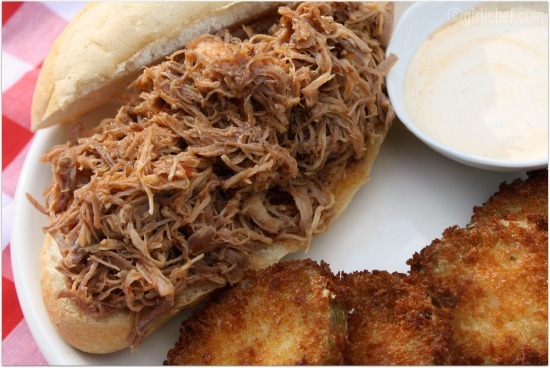 That pulled pork looks really tender and moist. I loved the movie, and I loved the book even more! I can't remember the last time I've had fried green tomatoes. Maybe it's time to try them again! How do you keep the batter on the tomato? Yum! This is the same recipe I use for fried zucchini. I have been looking for a good fried tomato recipe. This is a great one. Towanda!! Because I am older and have more car insurance!! Also....the secrets in the sauce....muhahahaaa! LOL, YES...one of my favorite lines! I looooove pulled pork sandwiches! They remind me of summertime as a little kid. 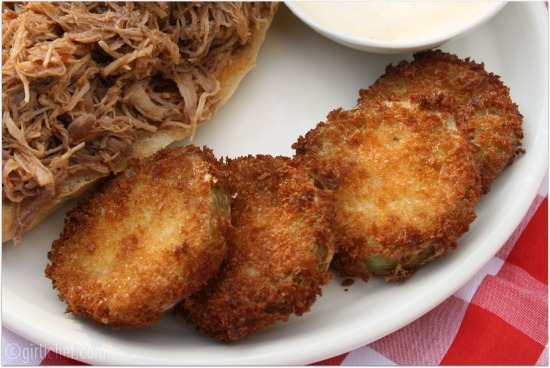 I've never tried fried green tomatoes, but yours look so good I'm intrigued!